Please note holding tank and pumpout certifications required for all vessels in Rhode Island waters. The docks at the Herreshoff Museum. 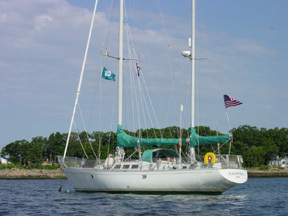 Bristol Harbor is but a short hop from Prudence Island , as are most destinations on the Bay. At the very head of the harbor is the ultimate sailing mecca, the Herreshoff Maritime Museum and America ’s Cup Museum . They are on the grounds of the original location of the Herreshoff company and next door to the ancestral home. They have moorings and dock space that can be arranged in advance and if you join the museum you get a free night’s dockage as part of the deal. The museum membership also has reciprocal privileges at many other maritime institutions. The only drawback is that the shower facilities are quite limited, but that’s a reasonable trade off if you get into the special air conditioned model room. This is a spectacular display of all the designs, with half hulls lining the walls, naval architectural drawings filling the chart tables, and small scale working model displays gracing the corners. This is worth the search. Make sure it’s open for you, and be sure to get a tour. You need the insights to fully appreciate the grandeur. Contact the Herreshoff Museum at 401-253-5000 or VHF channel 68. The town is a short and lovely stroll away from the harbor. Along the way is a convenience store for provisions (like a mini-mart but labeled a cigar store), and an avenue of stately homes restored to their former grandeur. The center of town offers many choices for restaurants, a Dunkin Donuts, lots of antique shops, and a historic district. Blythewold Gardens are a short distance away, as is Hall Spars  an amazing carbon fiber specialty factory! Visit the Bristol visitor's online resource for more information. Bottom Right: Click to enlarge the chart on the right. Not for navigation.